Hi ACC-tion heroes! Today we have a blog interview with Cayti Bourquin, the writer behind the wonderful Kickstarted comic, Paradox Girl! Check out the Kickstarter for issues 4-6. Marty interviewed Cayti about her process, her inspiration, and Paradox Girl’s origin story. But the first question was from Cayti herself. CB: What’s your favorite thing about comics? Not mine, just like, why comics? MG: Comics are a medium that you can do amazing things with–amazing stories and art that transcend nearly everything else. Capes and cowls are the new mythology and you can do pulp/noir in an age when those movies would not get green lit. I just love the ability for comics to tell whatever stories the team wants to tell! MG: Yeah, totally agree. And it just goes off into new and interesting places. CB: Yeah, and what you said about ‘new mythology,’ it’s very much a curse and a boon at the same time. Like the belief in these mythic figures keeps them around (Spider-man, Superman, etc) but it also reduces them in a way. They become iconic in a way, and that icon changes over time, but still transcends the actual continuity and story of the character. Which is sort of a curse, because like, even fictional characters – especially fictional characters -need endings. Closure isn’t a real thing that we often see in life, and stories give us that. They give us ‘happily ever after.’ For as great as the new Star Wars movie was (in my opinion) – it stole Han/Leia/Luke’s happy ending. MG: I’m not a writer – at least not of fiction – so would you tell me why you think, other than the happy ending, that fictional characters need endings? Is it just the happily ever after? CB: No, no, there’s a lot of reasons for needing that ending, that closure. I think the happily ever after is-a component of that. That’s as much for the audience as it is for those characters. I think endings give a ‘story’ its purpose and its meaning. 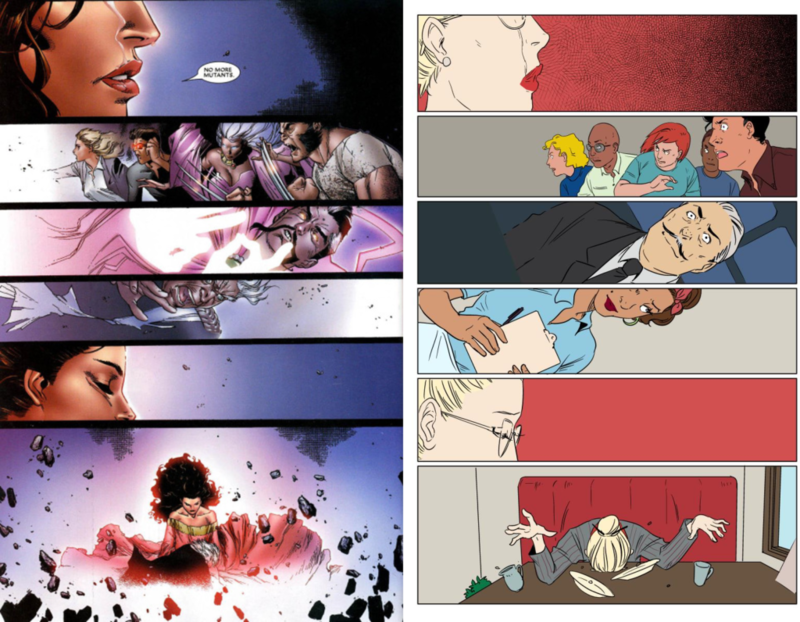 Even outside comic books we see the effect of non-endings all the time. Western TV for example. We renew a show if it’s getting good ratings, kill it off if it doesn’t, so hey if the story is interesting and doing well, then it gets dragged out. It doesn’t follow Freytag’s Pyramid, it has to introduce new twists, escalate things but then hey, eventually cancellation, and if we’re lucky we see an ending. But sometimes those characters, those plots end up in limbo and it’s unfair to those characters to be in that limbo forever. but you asked about why the fictional characters ‘need’ endings, and it’s because for us, the audience the reader, we know where endings go. We have a treadmill of entropy in our lives. Endings give meaning to the story and make it matter. Canonizes the emotional impact in a way. Like, now, every time Jean Grey or Captain America dies people shrug, “They’ll be back.” Wolverine’s dead ‘it’s okay, he’ll be back,’ the emotional significance of loss, of success of – well anything, is lost without some sort of ending-good or bad. Catharsis, release of that emotional buildup to feel the weight and then return back to our own entropic lives. MG: You’ve mentioned a lot of Marvel folk so far – want to move on to PG? CB: Certainly! I just reference other Marvel/DC stuff cause it’s ‘mainstream’ and sort of the template that people expect. You mentioned noir earlier and it’s hard to like, talk about noir and not bring up Maltese Falcon and such but yes, PG! MG: Oh man, that would be great. Bring up the Maltese Falcon! CB: My favorite scene is hands down where Peter Lorre corners Humphrey Bogart in his office and demands to search it, Humphrey Bogart takes the gun from him and they have a nice chat, it’s all smooth and pleasant and when he gives the guy the gun back he still demands to search the office and Humphrey just laughs and laughs. It’s such a brilliant scene. I have this other idea out there in my head (non-PG related) for mixing Mythos with Noir, having the unknowable and mythic sitting across from calm, unflappable detectives. CB: Ooh, I’ll have to check that out. MG: Very neat little short story. But, the next PG Kickstarter mention leads to a very important question: Have any favorite panels we can use to show off PG? CB: Oh, uh, certainly. I’d have to ask the editor but Paradox Girl is well it’s a story of it’s own, but it’s all super meta, right? Like it’s satire-not particularly biting satire, but it’s there. In the sixth issue, ‘The House of MMMMMMMMMM’ we did a recreation/tribute of the Scarlet Witches’ famous scene from like the end of that arc? MG: I love it, awesome! CB: Anyway, I love the page, it’s such a great recreation. Yishan did such a great job, so yeah that’s one of my favorite panels/pages of the next, uh, 3 issues. MG: She really did. Thank you for letting us use this page! So, on reddit, you mentioned that PG gets her origin on City of Heroes – can you go into more detail about her origin (sidenote – 3/4ths of ACC hung on out WoW [World of Warcraft], so this is a neat cross over for us)? CB: I played plenty of WoW in my day too. PG’s origin goes back further than that really, she was sort of a fictional version of myself, sort of some of that mid 20s self angst, a way to express and explore that. A demon named Lily who had reformed and turned Catholic and, you know, crosses still burned her, but she thought the only real ‘chaos’ was unpredictable, so she was making an active contradiction of herself. Anyway, all that nonsense aside, I made a version of her in City of Heroes and the name was taken, so Paradox Girl became the name, and she got a lot more light hearted and goofy but that’s her real world origin, is just sort of a young woman in her 20s dealing with existential self hate, and finding a way to sort that out. Powersets were Kinetics and Shadows for those who played CoH (miss that game!). MG: Has there been a base of support from CoH for your PG projects? CB: Oh, no no. City of Heroes was dead before the idea of even publishing a comic about PG really came to light. I’ve never been very active in any social aspects of an MMO, about the only place/story people might know…CoH allowed you to build like missions? Which I made a Paradox Girl themed one, the name escapes me, but it was played a lot and highly reviewed. It had the players facing down dozens and dozens of paradox girls who were all fighting amongst themselves. MG: That’s a really clever use of the idea! PG: Axiom Man is a page that still exists out there. I don’t think I ever made a Virtueverse entry for PG now none of that stuff is cannon in the comics that’s just all relics of previous incarnations. MG: What has been the biggest obstacle to getting your stories out? CB: Not having any idea how to market. Hana Comics is a sub-company of Hanako Games which is a company doing really well for itself, knows its market, knows how to sell games, etc but taking on comic books has been a big challenge of finding fans, how to bring it to market, how to let people know it exists. I call myself the reincarnation of Scheherazade (because I’m so obviously humble). I have 1001 stories burning their way out of my head, and it’s just a slow crawl trying to find a process by which I can deliver those stories. I’m humbled that Hanako liked my idea enough to start up Hana Comics, and there’s several more titles that I’m working on with them for but it’s not as easy as just making it, trying to get it in front of people is pretty challenging. Especially so for PG, because there’s no, I don’t know, “cliffhanger?” There’s no ‘dun dun dun!’ and the end of an issue to get you to come back to buy the next issue. Every issue is ‘self contained’ but connected to each of the other issues in lots of obscure (frequently contradictory ways). [People in the industry] were pretty insistent that for comics stores to want to stock our book we’d need to have that ‘dun dun dun!’ to be continued sort of thing. MG: Ugh, [People in the industry]. CB: I’m trying to do more than that with PG. I’m actively avoiding doing that. I want the reader to have that experience of that closed loop, to have something they can re-read four times before they get all the jokes. So, we moved to Kickstarter, which, was really really successful the first go around. I’m hoping the second one will be even stronger. For me it’s more about the numbers of people than it is the dollar amount. I want to give people something better than a lot of what I see that’s out there. I want them to believe in stories and the medium as something better than it’s been treated. MG: The new Image books – they’re really changing a lot of the medium. Usually for the better. It’s pretty amazing for those of us who remember the Liefeld Image era. CB: I don’t really blame them, I mean, they know the business better than I do. I just hate that that’s the world we live in, where market has an expectation and violating that expectation is hard to do (thus our hundreds of reboots and sequels in Hollywood). MG: You’ve mentioned ‘we’ a couple of times – can you give our readers a quick run down on the PG creative team? CB: Certainly! It’s mostly Peter Bensley and myself. He’s the editor/publisher/long time friend who’s part of Hanako and made the initiative to make Hana Comics. He’s the one who started going to comic conventions to find an artist that he felt was good enough to match the script I’d written for A Day in the Life of a Paradox. That’s where he met Yishan Li, who he commissioned to do some character design, check her interest; this was pre her work on Blue Beetle and Buffy. That’s really it, it’s the 3 of us. Yishan has a lot of other titles she’s working on for more mainstream publishers, but is still really invested in making PG a real thing and getting it out there and puts in a ton of extra time doing extra art and assets for us to use for the Kickstarter and such. MG: The art in PG is beautiful. She does the lines and the color? CB: She does the lines and inking. She colored issue 1, but because her time started to get to be valuable with those other mainstream projects, we outsourced the coloring to Alexa Fox of Challenging Studios (ed note: they manage the coloring team.) For issues 2-6, although Yishan does provide input on the coloring process as well, so that it matches her vision of my vision. MG: PG’s panel layout – and the how PG plays with the panels – is really cool. Was that something you and Yishan came up with? CB: That’s all me. All part of the original script in issue 1. I had wanted to be in comics for quite a while – I’d written a pilot for another story called Heaven and sent the synopsis to Dark Horse and never heard back from them (ugh rejection), but one night I woke up in the middle of the night, just laughing to myself about all these gags of PG, being able to dance back and forth between panels since a panel represents time and location tracing her path, repeating pages violating causality loops you could express all that in a ‘static’ visual medium in a way that you really could do properly in either a written or a moving one. MG: The lettering and panel work is very clever. Kudos to you and Yishan! CB: It was a big part of what I wanted to show comics could do. I don’t know if you’re familiar with House of Leaves. It’s a book, but it’s so much more than that. It’s meta and plays with the medium, so that the story isn’t just words on a page, it is the page itself and the book itself. MG: What’s one thing you think gets left out of the limelight when we talk about PG? CB: That it’s satire ultimately? It’s not very biting, but really, I’m making fun of characters who don’t get endings. Superman, Spider-man, Wolverine, they get new beginnings all the time but they’re too iconic to let go. Paradox Girl is parody of that. We jump the shark immediately and say “oops no origin story, ‘cause we’ve rebooted too many times.” She is the result of infinite retcons. There’s a deeper, more personal side there as well about the process of time and how that affects us, but I think issue 4 will bring that to people’s attention enough on its own. MG: Very cool. Very cool indeed. I want to shift a bit from PG to your creative process, if that’s ok? Can you tell us a bit about your creative process for writing? CB: I don’t know how to answer that really. For scripts I tend to start with a page by page outline so that I can make sure to have good page turns on the even pages. So that you have like, either something interesting, or a new development happen on a new page. I just briefly outline the story and how each page impacts it and then go about fleshing those in. I don’t think about it too much really, it’s more intuitive and reactionary. Where it all comes from? I don’t know, the ether? Obviously I’m influenced by things I see around me, media I expose myself to, stories that I love find ways and remix with other stories to tell new ones. One of the new titles we’re working on, LEGND, is like Buffy the Vampire Slayer meets Gossip Girl for the Tumblr era. MG: Oh! How far along are you in scripting that project? CB: We have a preview of it. A four page teaser-but the artist had a conflict and couldn’t stay on the project. I have 1 full script written that another artist is now working on, and an outline for the second script. Another title ‘Warning: Dead Inside” is being worked on as we speak, I just got back some inked pages for another 4 pager, i’m very excited about that title. And we’re pushing towards doing an Axiom Man comic as well, of which issue 1 is about halfway done in the art phase, scripts all done. MG: Oh, calm and straight-forward Axiom Man. CB: Yeah, we get to see what his ‘powerset’ and job is like, and how, he really is the counterpoint to PG’s contradictions. Axiom Man is truth and the search for truth. MG: Is this in a connected PG World or all different universes? CB: AM’s is obviously part of PG’s world, but the others are all in their own universes. Different genres. LEGND is very pop horror/comedy. Warning: Dead Inside is dark and brooding and cold psychological horror. MG: Got it! Okay, last question: If you can’t get Gillian Jacobs in a PG TV show, how else would you bring her out of comics and into a new medium? CB: Animated would be great. Obviously we have an amazing voice actress in Janna Polzin who did the KS videos for us. It’d be great to see her bouncing around on Cartoon Network or just a regular youtube animated series. Or action figures. Pow Pow! Buy 10 PGs! Have a fight between all of them! Mg: Now that would be awesome Well Cayti, thank you so much for taking the time to work with us? Have any words about PG or your upcoming Kickstarter? CB: Thanks very much for your time and uh, I guess for those of you who don’t know PG yet, check out that first issue, and I’m sure you’ll fall in love. The upcoming issues are just as amazing so don’t miss out! The Paradox Girl issue 4-6 Kickstarter drops today! Issues 1-3 are available here!